Despite having the highest average wage in the country of £2,724 per month, Londoners’ disposable income is £1,095 – only £12 above the UK average in the study. Average monthly outgoings in the city are £1,629, which is over £350 more than any other city. The UK city where residents have the most disposable income has been revealed to be Derby, with locals enjoying an average of £1,456 to spend per month after after tax, bills and general (essential) outgoings such as travel and food. 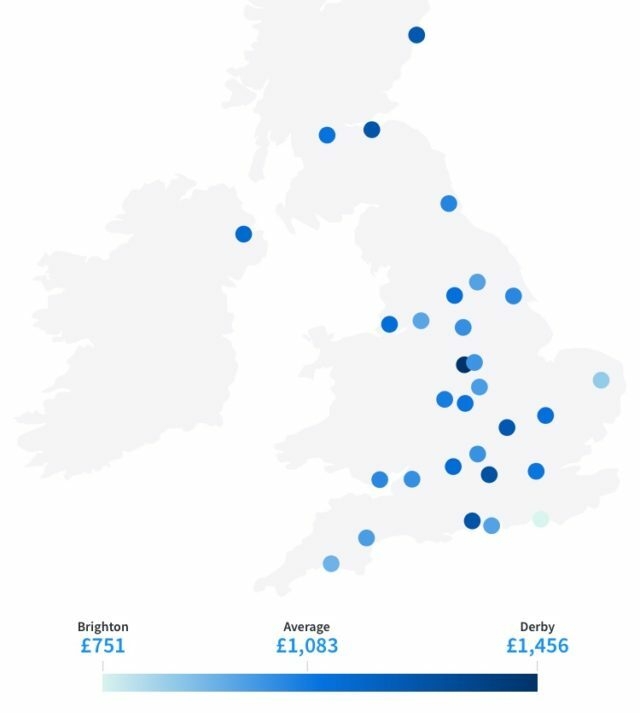 Derby residents earn around £200 a month above the national average, and have the second lowest cost of living in the study. Residents in Reading earn the second highest wage in the study (£2,473 per month) helping them to keep £1,287 after bills. This is followed by Southampton as the third ‘wealthiest’ city, where the figure is £1,264. This is significantly more than the British average in the study, which sees people keep an £1,083 per month after expenses and tax, to spend on non-essentials. The average monthly wage is £2,073, while the average (essential) outgoings, such as rent, travel and food, total £990.